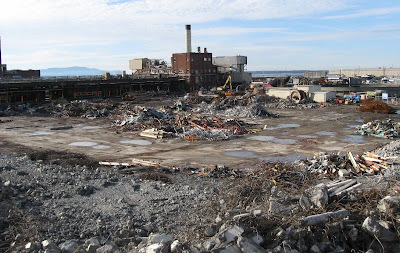 * Compilation of blog posts with pictures from tearing down of Gerogia Pacific pulp and paper mill in Bellingham. Below picture, November 26, 2008. 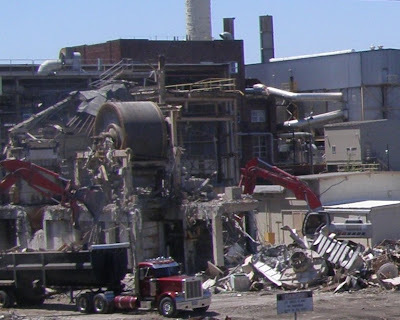 It's been interesting to watch them dismantle and recycle most of the paper mill. Recycled paper, recycled paper mill. 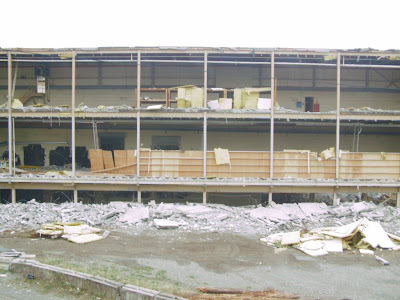 Some people still think it's quite a waste to build a mill and then tear it down. The sidewalk along Chestnut Street as it crosses the railroad tracks down to Roeder Avenue is a good place to look out over what's happening down there. Now that the tearing down of the paper mill is almost done, activity may be subdued for a while. 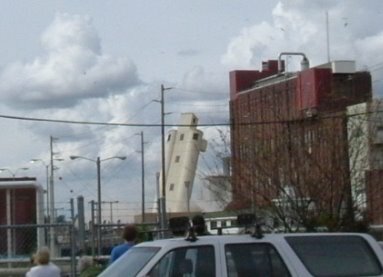 Old Georgia Pacific paper mill being torn down. Image taken a few weeks back. Pulp mill closed several years ago, in part do to an electricity price bubble. Prices for power gradually go up in Pacific Northwest as population and economic growth means a lower percentage of our power can come from our cheap hydroelectric resource. The hydro electric resource is only so big. God didn't build us enough rivers. Exasperating that problem was a "power panic bubble" of around 1999 and early 2000s. Enron was a big part of that. Prices spiked and then came down again. Our economy has it's underlying problems such as limited supplies of energy and land. People often want to buy houses when they say, "no more land is being made." These problems are gradual, but on top of this situation comes speculation. Companies like Enron take advantage of this to fuel panic. The bubbles and bursts become exaggerated and worse than the underlying situation. 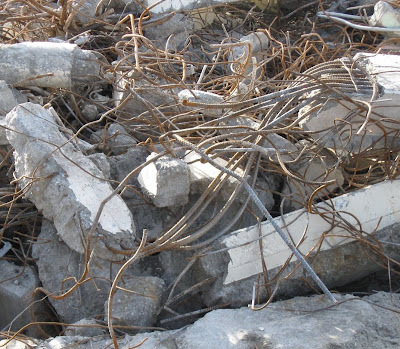 Increasing cost of wood chips in this area was another reason cited for GP to close. Wood chips from forest lands were the raw material in the paper making process. Those were the big picture, long term reasons for GP's demise, in my opinion, but there was also a big drama toward the end. A drama over the pulp mill's attempt to generate it's own power using portable diesel generators. This brought up air quality concerns. GP was located in the heart of Bellingham; practically downtown. Picture isn't that good as my camera was starting to die. Sand got in the mechanism for adjusting focus and exposure. Time to get a new camera. Luckily digital cameras aren't that expensive and they keep improving. GP used to get flack for using chlorine in the paper bleaching process. Some of that paper went to into photography. Most of it went to toilet paper, but pulp for photo grade paper was also made. Now days, digital cameras don't require all that paper and chemicals for developing the image. At least technology keeps moving forward. 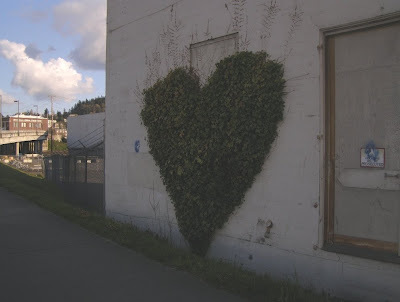 Picture of ivy growing in the shape of a heart in Bellingham. On the side of the Old Granery Building, Bellingham Central Waterfront. Fate of that building is still to be determined as part of the old GP / Central Waterfront rehabilitation process. Below photo taken February, 2012. 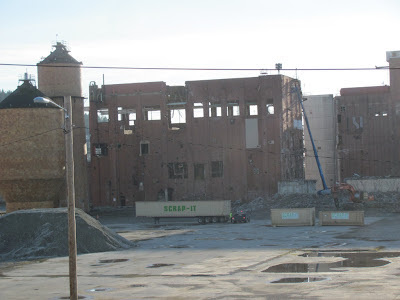 Next on the ever evolving list of old factory buildings to come down is the bleach plant. This process has been taking place for a few years. While much of the mill site has been torn down, they plan to preserve a few buildings; including the tile tanks pictured here. Surprise, I actually got it in a picture. Two concrete towers were imploded this afternoon at the old Georgia Pacific West Pulp Mill. Part of a long term waterfront renovation process. Bang, Bang, the towers came down and then a cloud of dust that was less impressive than I thought it would be. I remember "boom, boom" when those towers were in use. Something like rail cars were filed with a material that would drop into the silos, which (I think) were actually giant kilns. 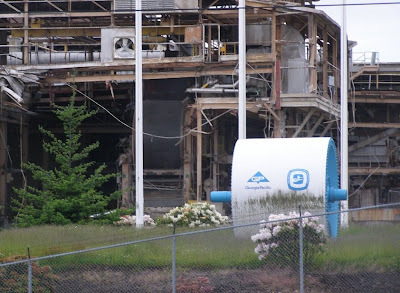 This created a toxic sulfur substance that was then pumped into the digester building for cooking wood chips into paper pulp. Digester building is just to the right of where the two towers stood. Residents of Bellingham would hear the booms when the material dropped into those kilns. It sounded like two rail cars coupling. Now the towers are gone as our waterfront continues to evolve. See More of my memories about GP.